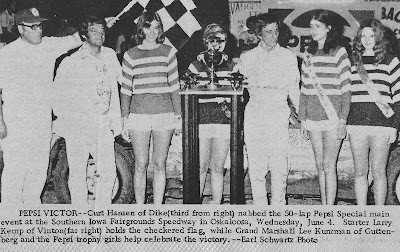 Oskaloosa, Iowa (June 4, 1975) – Curt Hansen of Dike, Iowa, captured the big Oskaloosa Pepsi Special super stock feature at the Mahaska County Fairgrounds on Wednesday evening. 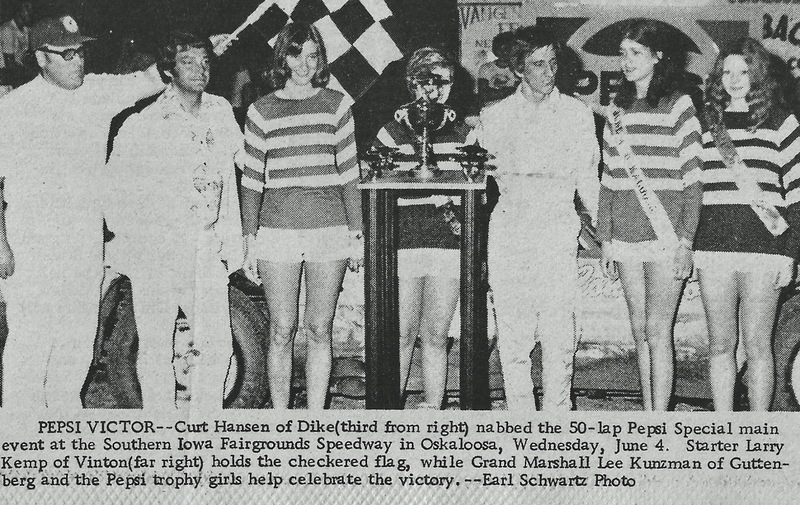 Hansen collected $1,000 for winning the 50-lap event. Hansen put his blue No. 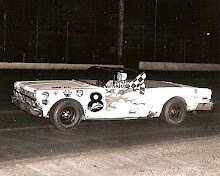 9 Camaro into the lead on lap 43 and held on to take flagman Larry Kemp’s checkered flag and the victory. Fred Horn of Marion, Iowa, was runner-up and Bob Kosiski of Omaha edged Mel Morris of West Liberty, Iowa, at the finish line to take the final podium spot. Just after taking the checkered, Kosiski would hit the first turn fence, riding it some ways and then flipping his car on it’s top. He would walk away with minor bumps and bruises. 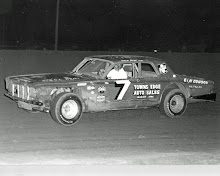 Roger Dolan of Lisbon, Iowa, took the initial lead from his pole position at the drop of the green. Hansen and Darrell Dake of Cedar Rapids, Iowa, would fall on Dolan’s tail. By lap 15 Morris had passed Dake and four laps later got by Hansen for second and set his eyes on the leader. 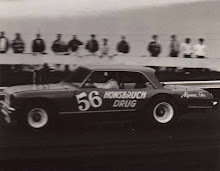 Hansen wouldn’t give in, however, and made it a three-car battle. On lap 30, Hansen slid past Morris and a lap later was side-by-side with Dolan for the top spot. Dolan and Hansen would bump and bang for the next dozen laps until Dolan started to slow. By lap 45 smoke was pouring from his car…a blown engine. Hansen would sail for the few remaining laps after that. Fred Horn would get past Morris for second (whose engine was overheating) but didn’t have the time to mount a challenge to Hansen. Bill Zwanziger of Waterloo, Iowa, was the only duel winner of the evening, winning both his heat and the consolation. 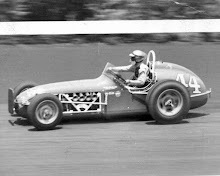 Don Hoffman of Des Moines won the Pepsi Trophy Dash. 10. 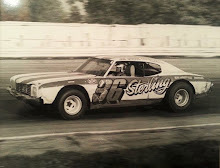 Tom Steuding, Altoona, Wis.